Sarahann started a position in the middle of February with Kentucky Probation and Parole as a Parole Officer. Her position is located in Bardstown Kentucky. 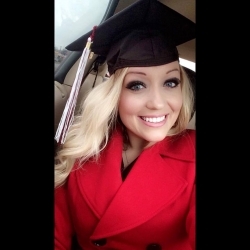 Sarahann graduated EKU with her B.S. in criminal justice December 2016 and was a Corbin campus student during the completion of her degree. -Why did you select EKU? I chose EKU because it was close to home and because it has one of the highest quality Criminal Justice programs in the nation. -Why did you select Criminal Justice and/or Police Studies? I chose Criminal Justice because it was the only program I was interested in that would help me achieve my career goal of being a Probation and Parole officer. Anything relating to Criminal Justice is very intriguing to me and I wanted to be a part of it. I wanted a career where I didn’t dread getting up and going to work every day and where I could help people and make a difference in their lives. -What are your educational/career goals? My goals were to graduate EKU with a Bachelor’s Degree in Criminal Justice then obtain a position as a state Probation and Parole officer. -When did you start your degree at EKU? I started my degree with EKU in the fall semester of August 2011. I graduated on Friday December 16, 2016. -What is your career goals? Going into criminal justice I kept my options open. I loved the thought of working with offenders and law enforcement. After many classes, research, and talking with friends who work with the criminal justice department, I set my heart on Probation and Parole. I thought Probation and Parole would give me the best of both worlds. It would let me see things through a law enforcement side, and it also would allow me to help change people’s lives and make a difference. -What advice or recommendations would you give prospective students considering EKU and Criminal Justice and/or Police Studies? My advice would be to never give up, follow your heart, and chase your dreams. If you don’t succeed the first time, keep trying. Nothing in this life comes easy, but I promise you it’s worth it in the end. It’s okay to get discouraged some, but after all is said and done, you will be so proud that you didn’t give up and you succeeded in getting that degree or your dream job. The staff at EKU are so friendly and determined to help you achieve your goals. Without the Criminal Justice program at EKU, I would not have been able to accept a position as a Probation and Parole Officer. I am proud to be an EKU alumni and I would recommend the Criminal Justice program to anyone wanting a future in this area.